The microwave oven cavity/chassis and door are made by metal-forming techniques, and then painted by electro-deposition, in which electric current is used to apply the paint. 1 )The process of manufacturing a microwave oven starts with the cavity and the door. First, the frame is formed using automatic metal-forming presses that make about 12 to 15 parts per minute. The frame is then rinsed in alkaline cleaner to get rid of any dirt or oil and further rinsed with water to get rid of the alkaline solution. 2) Next, each part is treated with zinc phosphate, which prepares it for electro-deposition.The resulting coating is about 1.5 mils thick. The parts are then moved through a paint bake operation where the paint is cured at 300 degrees Fahrenheit (149 degrees Celsius) for 20 minutes. The chassis or frame is mounted in a pallet for the main assembly operation. A pallet is a vise-like device used in conjunction with other tools. The cooking chamber is in fact a Faraday chamber, and it prevents the waves from coming out of the oven. 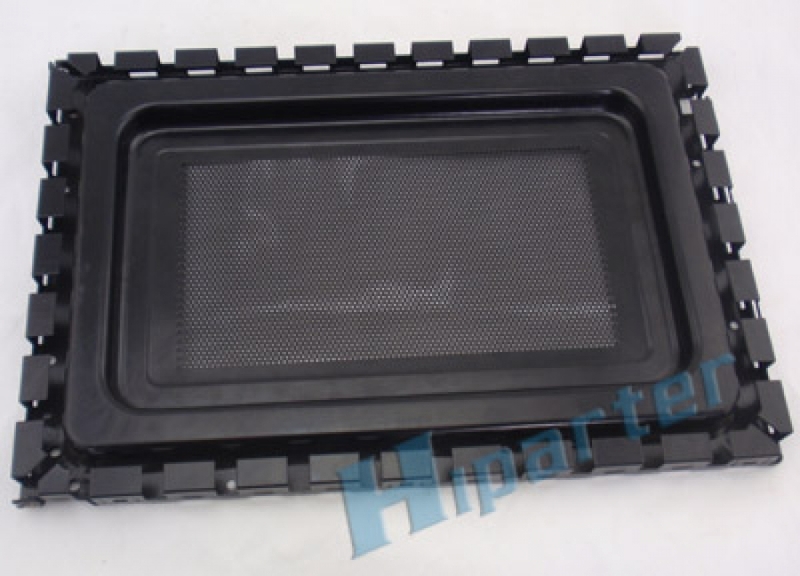 The oven door usually has a window for easy viewing, but the window has a layer of conductive mesh some distance from the outer panel to maintain the shielding.